Since their humble family beginnings over 50 years ago, Jayco RV has grown to be one of today’s leading RV manufacturers. This unique RV company has not only stood the test of time, but continues to impress customers year after year. But what exactly sets them apart? Find out July 14th at the Wilkins RV location in Bath, NY! 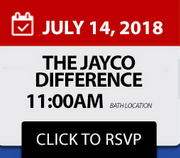 Join us at our Free Jayco RV Seminar discussing the many way Jayco stands apart from the crowd in construction, value and dependability. We will host an open forum Q&A session with Jayco factory representatives. Their expertise in the RV field is a extremely helpful when researching your next RV. Take a sneak peak at the brand new Jayco Floorplans that have just arrived. Take a tour of your favorite brand and feel the Jayco RV difference for yourself. The Wilkin’s RV location in Bath is New York’s Newest Jayco Dealer. We are stocked with the full line of Jayco Fifth Wheels, Travel Trailers and Toy Haulers at low sale prices. RSVP Today and join us at Our Dealership in Bath, NY between 11AM – Noon on July 14th. Get all your Jayco RV questions answered at this special free seminar.